Panel (R-L) Attorney General Pam Bondi; Connie Rose; Dr. Maulik K. Trivedi; and WUSF's Carson Cooper. 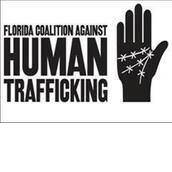 Human trafficking is the topic of a special Florida Matters show scheduled to air Tuesday, Aug. 26 at 6:30 p.m. and again Sunday, Aug. 31 at 7:30 a.m. on WUSF 89.7 FM. A panel discussion on the issue was recorded Wednesday at Tampa's Centre Club, sponsored by the Florida Medical Clinic Foundation of Caring. Carson Cooper, host of Florida Matters as well as Morning Edition, served as moderator. Members of the panel were Florida Attorney General Pam Bondi; trafficking survivor and victims' advocate Connie Rose of Tampa; and Dr. Maulik K. Trivedi of Florida Medical Clinic’s Behavioral Health division in Wesley Chapel.